There are two iconic looks for Cobra Commander. Yes, okay, the hood and the faceplate are both distinct, but they're still variations of the same outfit: same uniform below the neck, same "look." So yeah, the old blue suit is a classic, but then, so is the battle armor he wore later. Cobra Commander likes to be up front in the thick of the action when his Cobra Viper forces, Cobra Eels, and "Siegies" confront the GI Joe team. 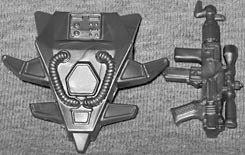 To protect the commander in the heat of battle, Destro had the best technical minds in his armament factory create a special suit of body armor that combines flexible bullet-proof polymer fabrics with beryllium steel plate components. The entire suit is air-conditioned, solvent-resistant, and ray-shielded. The helmet is fitted with an integral com-system, internal read-outs for environmental quality and a miniaturized computer display. Okay, the armor may not be as popular as the dress blues, but it is old enough to have retro appeal. Lots of kids couldn't get the previous Cobra Commander, so this was their only option. How nice, then, that the Generation 3 version of him is one of the best updates in the line! The armor is basically a series of silver plates worn over a light blue body suit, but it's looking quite nice, here. The suit is slightly wrinkled, and all the joints look like black rubber. 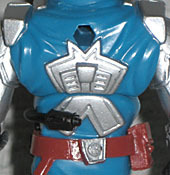 The arms and legs are entirely encased in technology, while he has to make do with just a Y-shaped plate on his chest, a bit in the center of his back and a silver codpiece. His belt, just a sculpted element on the original toy, is now a separate piece - including the holster on his leg and the black tube that plugs into his back! The helmet isn't a direct update, thanks to some minor changes, but it is very close; we even get the removable black tube that runs from his mouth to his ear. The Cobra logo is painted on, rather than sculpted, and the nose is a slightly different shape. And oh yeah, the helmet is removable! Sadly, we don't get a Fred head or even the real "beatnik" appearance, just Beachhead's skimask, redone in black. Of course, if you did get the Fred/Scar-Face comic pack, you can do you own headswap quite easily. The ball-and-socket head is simple to pop off, and though the neck joints aren't exactly the same size, they're close enough that Fred's noggin won't be rattling around. If you want it to be more secure, you could use the glue trick to tighten the fit. The shoulders, elbows, hips and ankles are balljoints, the wrists swivel, and the knees are double-hinged. There's no waist, of course, but the torso joint takes its place - shame that the armor on his chest and back has to split around the joint, though. In addition to the belt and helmet, Cobra Commander has two legitimate accessories: a gun and a backpack. The pack is the same spiked design as the original toy's, but it's been made larger for some reason: possibly to suggest it contains all the power and resources needed to run the suit. The gun is silver, and detailed nicely, so it definitely complements the armor. Of course, there's also a display base, in case you need help making CC stand. Not a lot of people were looking forward to an update of Cobra Commande's battle armor, but this figure is very well done and definitely fun. If you're on the fence, give him a chance: even if you weren't a fan of the original, this is a great modern interpretation.